This review is a long time coming. I have had the M5 in my possession for some time, and have been slowly getting it ready for the review. Glass, bipod, ammo, and a trip to a 600 yard range were some of the items I had to obtain before I feel I could really review this system. I am a long time 5.56 shooter and stepping up to a .308 is a leap in costs… but once you squeeze that gas pedal, you know your playing with power. With retail costs floating around $1400 (if you can find one), how much bang are you getting for the buck? The M5E1 follows the same concept as the previously reviewed M4E1 receiver: the upper receiver is a non-standard assembly with an integrated rail mount forged into the receiver itself. The barrel nut has no part in the rail attachment and only serves to hold the barrel in place. (YOU HAD ONE JOB!) The extended portion of the receiver is where the rail is mounted via 8 torx screws. I really love the simplicity of this system, but it will limit rail selection to Aero’s rails. They currently supply Key-Mod, M-Lok, and Quads in various lengths. The upper and lower fit together tight, and the fit and finish is excellent. Look at those deep roll marks! Lines match up from upper to lower, and the internal components cycle smoothly. The anodizing is jet black and clean. The rifle was equipped as a DMR style build with an 18 inch nitrided barrel, 12 inch M-Lok rail, and a Magpul PRS stock. I added a SWFA 6×42, Magpul Bipod, and shot mix of nato rounds and PPU match ammo. The integrated trigger guard melds with Magpul grips. As equipped: Magpul PRS stock, Warne 30mm mount, SWFA 6×42, Magpul M-Lok Bipod, Magpul RLS. The first rounds I put through the M5 were some 1970’s era 7.62×51 ball. The ammo was tarnished and very gritty. This ammo has been sitting around in the ammo can for many, many years. Does it age like wine? Well, I don’t know about that, but the M5 cycled magazine after magazine. During sight in, I noticed something off… The smell of the burnt powder varied from shot to shot. One shot would be a nice, refreshing gunpowder smell, and the next would be very foggy and acrid like a smoker’s 1992 Buick LeSabre filled with burning dog hair. The ammo was grouping like a large grapefruit at 100 yards too. Hmmm. I tore the wrapper off some of the .308 and realized that this ammo was a mixed lot of years, and mfgs. I had no idea. I just thought it was old M80 ball from a singe lott! It was all wrapped so nice! That’s what I get for using this stuff for free. So how did the rifle do? The Aero M5 had no failures to feed or cycling issues of any type with this old, corroded, mixed year, mixed mfg ball ammo. I shot a good 100+ rounds of .308 at this range session. This rifle just didnt choke. Color me impressed. I then packed the M5 away for the 600 yard line and ordered some new mfg rounds. Disgusting Brass. Chewed up and spit out. When my order of PPU 155 grain match arrived, I set off with a buddy to a public range which offered 100-600 yard with steel. I got the M5 setup and re-zero’d with the 155 grain match. I was holding around 2 moa with the M5 and the PPU, but do not consider the accuracy portion of this review complete. I will cover the rifle accuracy in a separate review once I develop some hand loads. The torn case sitting on the range bag was a 6.5 grendel I found. OOF. Not Mine! The M5 + PPU let me engage targets from 300-600 yards at will. At 400, head-shot swingers were repeatable with the bullet combo, and at 600 human silhouettes were hits over and over. The wind was at roughly 10/11 o’clock at roughly 10-15 mph with a temperature of 55 degrees. Shooter affected? Yes. I was freezing from lack of adequate clothing and had wet feet from the range conditions. I shoot these guns for you guys, and not for myself. Torture it is! Holding under the man sized silhouette’s shoulder with 4.9 Mrads of elevation made hits over and over again at 600. Sweet. With the PPU I had three failures to feed and a failure to lock back. I won’t fault the M5 with this as during the previous session with old mil-spec M80 ball it was 100% reliable and locked back every time. The PPU might be a tad weak for the M5, but it was serviceable for the range session. Now its time to buy dies and build a real match bullet! I have a few suggestions for Aero Precision. I would like to see these beasts equipped with a better trigger. This is a wish list item. Understandably, it ships with a standard mil-spec style trigger. This trigger was fair for a mil spec trigger and it didnt stop me from getting good hits, but having something a bit nicer wouldn’t hurt. My other thought is that the magazine catch appears to need more thread engagement. Its trapped by the mag catch hole so no worries just an observation. Neither of these items caused any issues, so that’s just me ruminating. Since AP sells the receiver set as a builders kit, you can spec out the rifle however you want if you are a DIYer. That said, this rifle is FRIGGIN’ SWEET. It makes me happy everytime I pull the trigger. As far as I can tell, Aero has a winner with this product. I like the reliability. Grab and go, sight in, crack the sound barrier over and over again no drama. The ammunition I started out with was literally a worst case scenario I have ever fed a rifle, EVER. That ammo belonged in a museum, and I have never shot loads that smelled like burning acid, but there you have it. M5E1 no care. Once I develop some hand loads, I will examine the accuracy potential of this rifle in a short addendum article. The nitrided barrel is the “standard” barrel, and due to limited funds this month (when did Legos get this expensive?) I only had the funds to shoot the well priced PPU match. The rifle is a great compliment to the M4E1 and big brother M5E1 is a smooth shooting, heavy hitting rifle. So while this rifle is equipped as a DMR build, I could easily imagine it with an ACOG, A5 stock, and a comp for more of a battle rifle setup. This rifle is a great value and I enjoyed the range sessions I have had with it. I will be shooting it at longer ranges and to see how far I can eventually reach out when the opportunity presents itself. With my sample performing so *reliably* with mil-spec ball, it has my recomendation. Watch for it going foreward. Gonna need to rotate rifles into the articles! 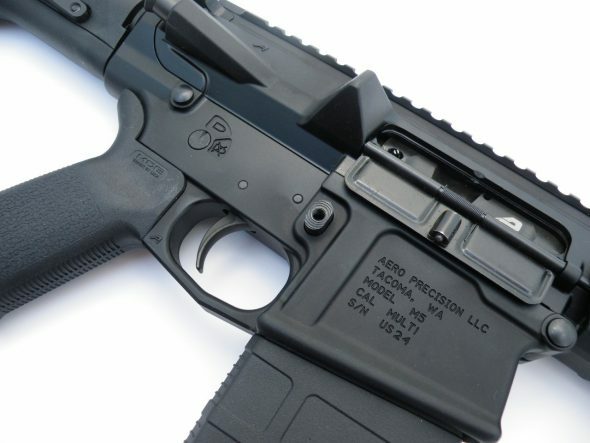 Disclaimer: The upper was paid for by ME, and when Aero heard I was building the M5 they provided the lower to equip me with a complete rifle. The optics, ammo, magazines, bipod, and sling were all self purchased. The article above are my thoughts and I do not get comission for M5E1 sales through Aero Precision. Ready for another review soon? How does the Palmetto State Armory AK do when baby its cold (and muddy) outside? Communists did this. The only explanation. Gotta love a 308 AR. Mine has a 20 inch chrome lined Criterion hybrid profile. Its a solid 3/4 to 1 moa rifle. 8208 flows like water in a progressive press. I built mine in 6.5 CM with a BA 16” barrel, NF SHV 4-14×50 easily a 600 yd rifle. My new favorite rifle. That looks nice! I’ve had a 308 lower built out sitting in my safe for at least four years now, but I’ve never gotten around to finishing the upper half. I also have an M5 stripped upper that I’m not doing anything with. Perhaps two large frame ARs in 308 and 6.5 CM might be the path forward in the long run. Use an extended mag release to solve th thread issue .. I did and it works perfect. I built mine with a Mega 18″ bbl. And with a G sse trigger and a 2.5-10×30(something) vortex pst (1st gen) it is a wonderful shooter. I run it suppressed and a 20 rnd mag. My only complaint .. it’s heavy. I plan to build a ultra-lightweight 18″ AR308 soon. Now that will be expensive .. but it’ll get an ACOG and be my go to rifle for all-purpose use. Again .. I look forward to an accuracy review. Mine is 1 moa with surplus .. & 0.5 moa with remington match .. (all suppressed).